Wild dolphins need up to 33,000 calories a day, researchers have found – equivalent to about 60 portions of salmon. In contrast, Olympic swimmers – who are smaller and less active – burn about 12,000 calories a day during training. Studying the metabolic rates of whales and dolphins is important for their conservation, say scientists. They found that a common bottlenose dolphin needs 10 to 25kg of fish each day to survive in the oceans. 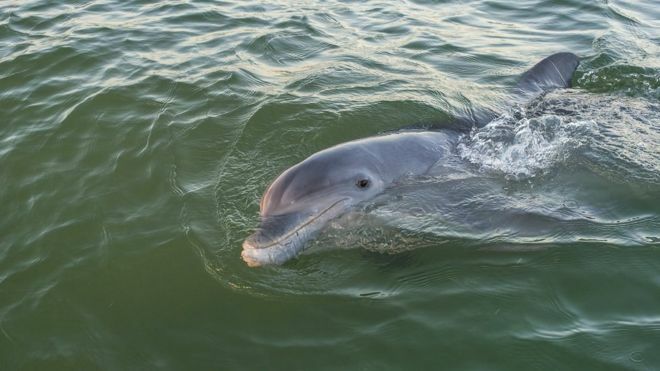 The study was carried out on common bottlenose dolphins living in Sarosota Bay off Florida. Adult and young dolphins were captured briefly to measure their resting metabolic rate. This provides an estimate of how much a dolphin needs to eat in a day, said Andreas Fahlman of Woods Hole Oceanographic Institution and the Oceanografic Foundation in Spain. “We can then add this up for all dolphins and estimate how much fish/prey they need,” he said. The researchers found that a 200 kg dolphin would burn between 16,500 and 33,000 calories a day, which is lower than expected. In contrast, an Olympic swimmer carrying out intensive exercise might need around 12,000 calories. For a dolphin, the amount of energy required depends on whether the animal is resting, sleeping, diving or swimming, as well as the temperature of the ocean. Finding out more about the diet and energy requirements of whales and dolphin will help in their conservation, say the researchers. They measured lung function in wild dolphins for the first time. “Lung function testing of wild populations in different areas of the world may help us understand respiratory health in wild populations,” said Dr Fahlman.